According to the World Bank, ICT networks are now considered the fourth vital enabling infrastructure, after water, transport and power. There is also a close correlation between investment in technology and rising productivity: for every 10 percent increase in broadband there is an incremental four percent of GDP growth. At the same time, telecoms and media are converging, with the traditional divide between TV, phones and computers becoming increasingly blurred. How do governments use this to their advantage? That was the subject of the third presentation, by Robert Pepper, Head of Government Affairs at Cisco Systems, entitled ‘ICT infrastructure for economic, social and media development in Libya’. Any public policy must include both social and economic goals: ensuring both diversity and social cohesion in the first case, and promoting jobs and growth in the latter. Pepper introduced the Global Information Technology Report, which maps 100 countries according to their ICT infrastructure and GDP. Libya ranked consistently low over the last four years when compared to countries with a similar per capita income, such as Chile, Latvia and Poland. Libya also scored poorly on the general business, regulatory and infrastructure environment for ICT; the readiness of individuals, businesses and government to use and benefit from ICT; and their actual usage of available ICT. Libya may be starting from a low base, but Pepper predicted rapid growth, with internet traffic in the Middle East and Africa as a whole set to increase form 0.8Gb per internet household per month in 2010 to 7.3Gb in 2015. This has potential benefits for the economy, but the government must provide the right environment for this to take place. Pepper outlined some solutions, such as providing clear rules and building the necessary infrastructure. With the increase in use of social media seen in the revolution – not all of which was accurate – he also stressed the need for a proper regulatory framework. Finally, he expressed his hope that Libya could begin making up for lost time even during this transitional period. Libya currently enjoys worldwide interest and support, so the government can capitalize on this to make rapid advancement in as little as six months. 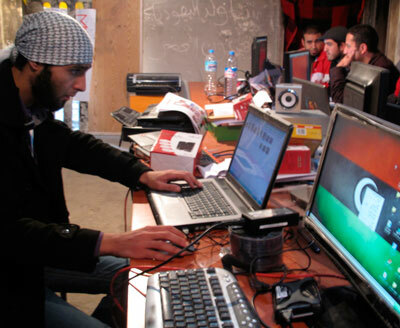 Libya’s limited infrastructure has been damaged by the war, with many microwave transmitters bombed by NATO, and there are many remote areas that have never had internet access. That means that any plans to reach the entire country will likely be expensive. Telecoms engineer Mohammad Bala pointed out that some Libyans had little interest in the internet in any case due to the limited amount of Arabic content. He added that while most major cities do have fibre optic cables, they often do not connect to houses, meaning that further investment will be required even in urban areas. Asked how he would tackle the problem in the interim period, Pepper suggested a national plan that includes all the provinces and tackles the full range of infrastructure, including water, power and transport. He also pointed to the rapid pace of technological change, meaning that any investment must be future proof. He suggested that mobile operates share some infrastructure, such as towers, to cut costs. That would allow competition but reduce the necessary investment. He suggested existing infrastructure be repaired, and that at the same time operators be given temporary licenses so they can be regulated. There was widespread interest in the possibilities of wireless internet access, particularly over mobile phone networks, as well as debate on whether or not, and how, to regulate the use of citizen journalism and social media. Patrick Forbes of Forbes Associates raised the model of GCC countries, which block access to certain websites, but warned against using that technology to block sites that the government finds uncomfortable. There was widespread agreement that although Libya is starting from scratch, it has the opportunity to build a modern system. That requires both allocating sufficient resources and choosing the right approach to ensure that whatever solution Libya decides on proves to be an investment in the future. At the same time, telecoms and media are converging, with the traditional divide between TV, phones and computers becoming increasingly blurred. How do governments use this to their advantage? That was the subject of the third presentation, by Robert Pepper, Head of Government Affairs at Cisco Systems, entitled ‘ICT infrastructure for economic, social and media development in Libya’. Any public policy must include both social and economic goals: ensuring both diversity and social cohesion in the first case, and promoting jobs and growth in the latter.